A Maundy set is a specially struck series of silver coins of penny, twopence, threepence, and fourpence denominations. 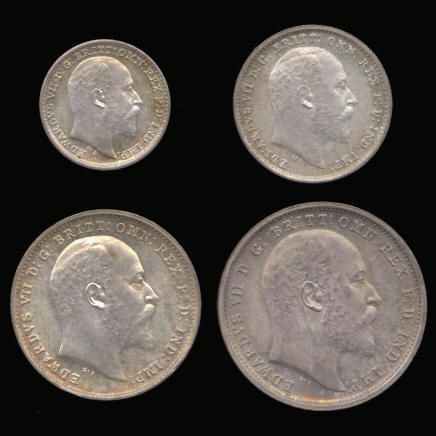 The coins are always of .925 fine silver except for the years 1921-1946 when they were struck in .500 fine silver. Although legal tender, the coins are not intended for such, and are struck with a proof-like finish. 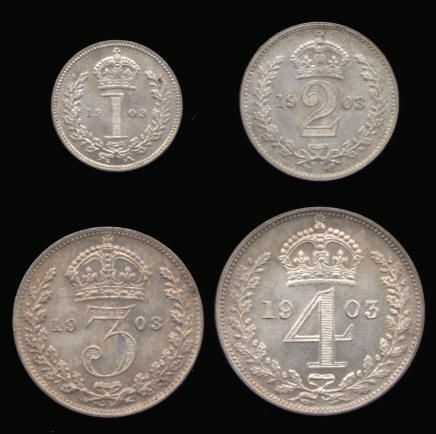 You may often see dealers offering threepence coins as Maundy threepence when they are regular strikes. The coins are distributed by the monarch on Maundy Thursday which is the day before Good Friday. The use of specially struck coins was begun for Charles II in 1661. Purses of Maundy money are given to one man and one woman for each year of the monarch's age. This is a continuation of the tradition where the monarch would was the feet of as many beggers as he had years in his age. Coins in their original plush boxes and complete bags command a higher value. Beware offers that include an undated modern box as these boxes are not original (the coins themselves probably are, though).